That time of the year when flowers bloom, birds chirp, the air is warm and I have no idea how to dress. It's too cold for bare legs, short sleeved dresses and sandals. Too hot for wool pants and skirts and boots. So, I am left with jeans and a few tops I keep using, while trying to catch up on laundry and ironing as fast as I can. Since I have a bad eye infection and the doctor ordered to stay at home for a week, I did what every wise woman would do: turned t Pinterest for inpiration. The first outfit is my absolute favourite. I don't own a suede jacket (unfortunately), and I'd substitute a brown leather bag for the black one, but I love the 70s feel. As for the others... The good news is that I own enough clothes to copy most of them - sometimes not the exact colors, but the feel for sure. That's all for now, but I would love some more spring inspiration. I hope you are feeling better soon! 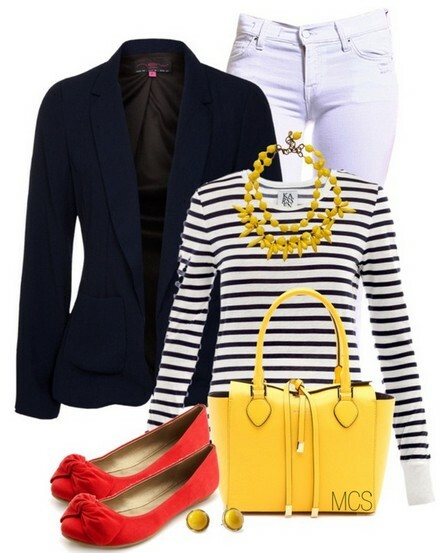 i love all of those outfits and need to bust out my white jeans more! What I wore - to work.